Genevieve Jacobs, Jacinta Collins, Giulia Jones MLA and Sonia di Mezza. Photo: National Office for the Participation of Women (2018). International Women’s Day, celebrated earlier this month, shone a light on the need for a better gender balance across all areas of society including government, business, media coverage, sport and employment. For decades, women, particularly religious women, have called for a greater voice and fairer representation in the leadership of the Catholic Church. While women make up more than two-thirds of the consecrated religious in the world, they are barely represented in Church decision-making processes. 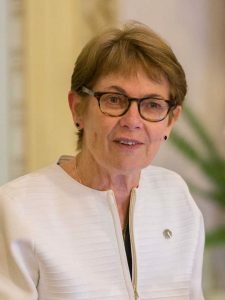 There’s been great contention over the fact that there has been only one female undersecretary at a time of the Vatican Congregation for Institutes of Consecrated Life and Societies of Apostolic Life. Earlier this year, L’Osservatore Romano’s editor Lucetta Scaraffia wrote in the ‘Woman-Church-World’ supplement that reform, not revolution was needed to ensure greater involvement of women in the Church. She notes that the 1983 Code of Canon Law allows for “many possibilities for institutional participation” for women and all lay people, but “the impediments lie only in the refusal of many to make real an equality already recognised and accepted in theory”. Scaraffia believes the existing organisations of religious women could be consulted as effective spokespeople of ecclesiastical institutions, rather than the “practice of the hierarchy currently in force of choosing individual female figures”. “It would be possible in this way to avoid a paternalistic relationship with regard to the women religious and a selectivity that risks rewarding the most obedient rather than the most competent sisters,” she writes. The Vatican Synod of Bishops last October, focusing on Young People, the Faith and Vocational Discernment, ended with one of the strongest calls to date for the inclusion of women in Church decision-making structures, saying it was a “duty of justice” that requires a “courageous cultural conversion”. While the file 60-page final document made no mention of issue of the ordination of women to the priesthood or diaconate, it did recognise that women have been excluded from Church decision-making resulting in an impoverished debate requiring urgent change. Voices of Faith has recently launched the Overcoming Silence campaign to advocate for Catholic women to be in leadership and decision-making roles in the global Church, from the local level to the Roman Curia level. The campaign asks Catholics to upload a photo and personal message of why they think it is important for women to be part of the leadership of the Church. To date, 524 voices had been “heard” including a message posted by Bishop of Parramatta Vincent Long Van Nguyen OFMConv who wrote, “Until we have truly incorporated the gift of women and the feminine dimension of our Christian faith, we will not be able to fully energise the life of the Church”. An official process of change to bring women to leadership roles at all levels in the Catholic Church. They have also set a target to have 30 per cent of leadership positions in the Catholic Church to be open to and filled by women by 2030. In a recent interview, Voices of Faith’s Sydney-based Communications Consultant Stephanie Lorenzo told the Sydney Morning Herald that more than half of the world’s 1.2 billion Catholics are women but the decisions that affect all Catholics are made only by men, and that needs to change if the church is to have relevance and longevity. 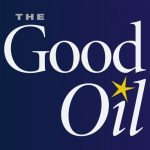 As part of our International Women’s Day focus, The Good Oil has asked three Catholic women to give their view on how the Church can promote greater participation of women in leadership and decision-making. The big challenge is for women to be engaged in leadership at the formal decision-making level. 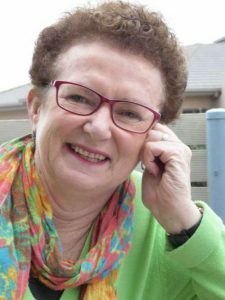 We have many women working as leaders in Church organisations and as heads of ministries, but when it comes to the next level of Church decision-making there’s little, if any, formal representation. The Church is poorer when we don’t include the voice of women. We are seeing greater consultation of women by the bishops and women are asked for their ideas and opinions, but they don’t have a seat at the table when it comes to making decisions. We need a seat at the table at the start of the conversation, so we can help shape the agenda. The recent Synod on Young People the Faith and Vocational Discernment is a good example. Some women religious leaders were invited to attend, but were not able to vote. However the attending men religious leaders were able to vote. It was pleasing to see at the February meeting 2019 on sexual abuse there were 10 leaders from women’s institutes present and three women were presenters during this conference – a small step in a much larger question. In Australia, the cooperation of the Australian Catholic Bishops Conference (ACBC) and Catholic Religious Australia (CRA) in the leadership of the Truth Justice and Healing Council has been a very positive step forward in outlining the Australian Church’s response to safeguarding and child protection. Last week, the CRA Council met with the permanent committee of the ACBC to canvas a range of issues that will help inform the agenda for decision-making. These are good signs of movement, but we need to do much more of this across the Church, and with far greater representation of lay people as well. In the early Church, women were represented, but ‘herstory’ has been minimised in the telling of ‘hisstory’. When you look over the Church’s year there are fewer Gospels featuring the faith stories of women compared to the faith stories of men. For instance, I often think we over emphasise Peter’s declaration of faith saying, “You are the messiah, the son of the living God” (Matthew 16:16), but we don’t balance that out with somebody like Martha who says “Yes Lord, I believe that you are the messiah, the son of God, the one coming into the world” (John 11:27). Martha’s leadership qualities aren’t recognised like Peter’s. We need to find more ways to tell ‘herstory’ and that includes finding new language that is inclusive, rather than exclusive of women. Sister Monica Cavanagh RSJ is the President of Catholic Religious Australia and Congregational Leader for the Sisters of St Joseph. The Australian Catholic Church could immediately do two things to involve more women in leadership and decision making structures. Firstly, dioceses could look to the patterns of organisation that exist in dioceses that have women involved at high level leadership, for example women have been chancellors in the Archdiocese of Adelaide for many years and recently Sr Catherine Ryan RSM has been appointed Chancellor for Ministries in the Diocese of Parramatta. Every diocese could create similar leadership positions for lay men and women. Secondly, the Australian Church could insist on every diocese having a Diocesan Pastoral Council with elected lay leadership. Currently there are only six of the 28 dioceses with these in place. Representatives from Diocesan Pastoral Councils could serve on a National Council for the Laity. Many countries, such as South Africa, Philippines, Nigeria, already have National Councils for the Laity, which partner with local bishops’ conferences in the leadership of the Catholic Church. Leadership opportunities such as these would not only open the Church to the rich expertise and qualifications that lay women bring, it would also create vocational pathways for women to make a significant contribution to the leadership and life of the Church. Setting targets for increased participation can be a good thing to work towards. But we need more than just counting the numbers of women in leadership positions, we need to change the culture within our Church and identify new models of leadership that are sensitive to the lives and needs of lay people and the challenges they face. Andrea Dean is the Director of the National Office for the Participation of Women. The issue of women’s participation in the church is complex, but at its heart I believe it’s about changing the culture. Whenever you are dealing with cultural change, it’s always a marathon, not a sprint. We are seeing some slow shifts, but there is so much more that can be done within the current structures of the Church, such as appointing more women to parish councils, seminaries, diocesan boards and national bishops’ committees, and in making these appointments to consult with women on who the best candidates would be, and to look beyond the “usual suspects”. Often religious women get appointed to positions, but there are far more lay women in the church than religious women. We need to give a voice to lay women – not to mention lay men – so that decision making is not just the domain of the ordained or consecrated, but the domain of all the baptised. We can look to society for signposts towards fairer representation for women. Many political parties and companies these days are introducing quotas to ensure a better gender balance. Is it time for the Church to work towards a target of 50 per cent female representation on all Church bodies? Unfortunately, misogyny is still present in aspects of the Church, as it is in other areas of society. To move forward we need a culture of mutuality – where women can genuinely co-lead with men. Far too often when there “appears” to be collaboration, women are kept on the fringes of decision-making. They are consulted, but not co-creators of decisions that directly affect them in the areas of faith and morals. Another key part of this issue for me, is ensuring that women are not excluded by language. If women are excluded in religious language, they become excluded in the consciousness. One of my favourite quotes comes from Alice who observed beyond the Looking Glass, “I don’t think they can hear me, and I’m nearly sure they can’t see me. I feel somehow as if I was getting invisible”. 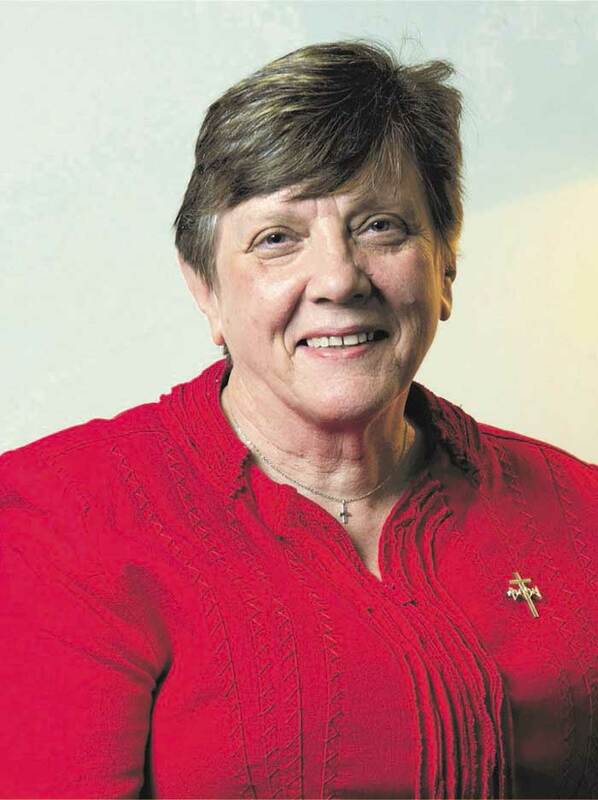 Sister Patty Fawkner SGS is the Congregational Leader of the Good Samaritan Sisters.